What do we mean by "the sweet spot"? I've noticed the expression bubbling up in the past few weeks, both in conversations and perhaps because I felt in my own sweet spot. 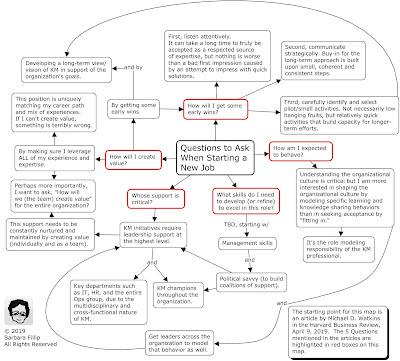 As it percolated for a while I was interviewing for jobs. I've always thought of job interviews as being in the hot seat, which is a very uncomfortable spot to be in, nothing sweet about it.... unless you are able to turn it into something else that puts you into your sweet spot. There is nothing manipulative about it and the interviewers still get what they need, but instead of answering typical interview questions in a somewhat artificial manner, you anticipate what the questions are going to be and what the interviewers really need to know about you, and you gently lead a conversation that both allows you to give them the answers they need AND present you in a uniquely YOU fashion. This is no longer an interview, this is you demonstrating how you interact and communicate with people, how you talk about the stuff you know (demonstrating your subject matter expertise). If you hit the right spot early on, the interviewers start engaging at a deeper level. They are no longer going through a checklist of questions they've prepared, they are engaging in a conversation with you. You're not asking a question about company benefits, you are asking a question about something they just said about the company's organizational structure and you want to know how that affects the culture, etc... You are not interested in the job per se, you are interested in helping them address a challenge, you are interested in the work to be done. It's almost an initial consulting conversation where you want to understand what the client needs/wants and you want to demonstrate your capacity to help address that situation. Forget the resume. Don't tell them what's on the resume, show them how what's on the resume translates to a real person who communicates in a certain way and engages with people in a certain way, who knows her stuff but doesn't claim to know everything. You can fake all kinds of answers to standard interview questions, but you can't fake an entire conversation, so they'll see the real you, which in the end, is where the sweet spot lies. Can you, in 60-90 minutes, reveal your sweet spot? What does that have to do with Knowledge Management? A job interview is an opportunity to sell yourself as a potential employee of the organization, to demonstrate your potential value to the organization. Attending the KMI Showcase 2019 in the past couple of days, I was reminded of one of the key skills that Knowledge Management professionals need to develop, which is the ability to sell KM in many different ways, often without highly visible branding, even in stealth mode when needed. That connected with what I've learned in the past decade of working almost exclusively on KM, the need for continuous conversations as the primary, most effective mechanism to sell KM and "educate" people about the value of KM. Even in the online KM class I've taught, I'm convinced that 90% of the value for the students is in the conversations that happen in the discussion board, which I guide, gently but very actively. Getting the students to engage early and in a sustained manner is critical, but they will do so only if they perceive value. I discovered the same is true in a job interview, but within a more constrained timeline. You need to get the interviewers to engage early and maintain that level of engagement through a productive dialogue. Perhaps this is a good example of tacit knowledge I did not realize I had and only recognized as a useful insight after the fact, reflecting specifically on the last three interviews and related interactions I've had with potential employers. Thinking back, this approach actually evolved over the last three interviews. It was only intentional in the sense that I wanted some control over the interview process in order to feel more comfortable and I like to go in very prepared. So, how does one prepare for a conversation as opposed to preparing to answer questions? I create maps. These are essentially maps of the conversation I'm hoping to have, highlighting key things I'm hoping to say, but also questions I have. Some parts of the map can even be shared with the interviewers if it helps start the conversation. For example, I use three very simple maps to discuss the three stages of my career, as an alternative to going through my resume. The mapping process helps me connect all kinds of different pieces of prior experience and accumulated knowledge. Once I've made those connections not just in my head but visually on a map, I don't need to try to memorize anything. The only thing I need to memorize is the same thing I would memorize for a speech. What's the first thing I want to say? What's the last thing I want to remember to say or ask? I want a clear plan for my opening and closing and then I can trust the map in my head to help me guide the conversation (or answer questions if the interviewers keep referring to their pre-planned questionnaire). Now I'm wondering if I should try to apply this more generally to all critical meetings/conversations. Even a KM pitch would be more powerful as a conversation than a one-way sales pitch. All that being said, I remember a job interview long ago during which I said very little but listened very attentively and... I got the job. Either I got the job based on the resume or it was based on demonstrating good listening skills. I'm not sure which one it was but the job turned into a wonderful professional experience. That was also the first time I approached a job interview with a map to bypass or supplement the resume. 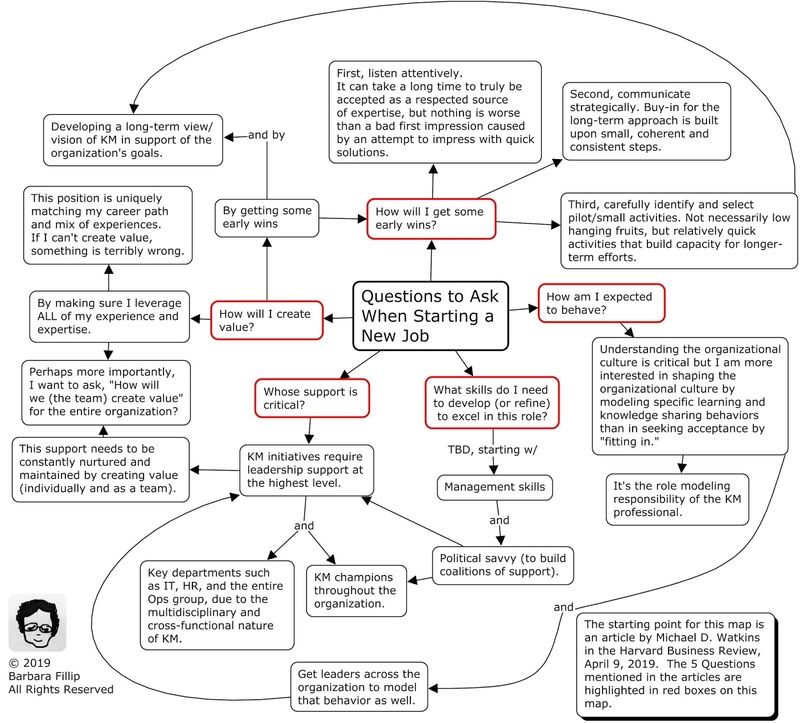 This is a map that came out of some reflections based on the Modes of Learning MOOC I mentioned in another blog and how it intersected with some other aspect of work (or work aspirations). It made me realize how comfortable I am constructing these maps and then using them to talk for hours if I had to. I should try doing an entire lecture for one of my courses from a map, with links and resources attached. This one is about creating an environment for highly distributed collective learning using both virtual and face-to-face learning "spaces". 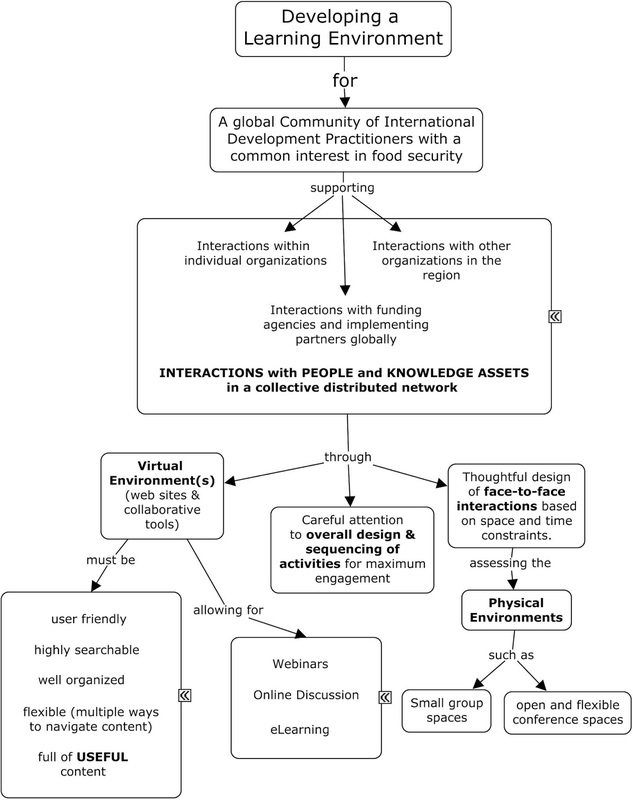 Inspired by the IDEAL activity and the Modes of Learning MOOC.